Canada’s Classic Cocktail: Hail Caesar, eh? My daughter and her family recently moved to British Columbia, Canada, and it’s been fun to visit them and experience the Canuck cuisine – poutine, beaver tails, Nanaimo bars, peameal bacon, ketchup-flavored potato chips, and multiple variations of maple syrup. On one of my recent visits, she introduced me to Canada’s signature cocktail, the Caesar. 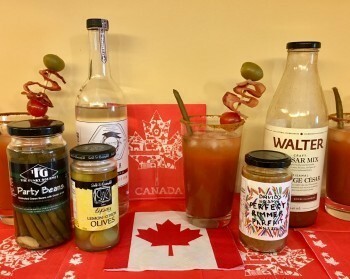 This cocktail is a Canadian twist on the Bloody Mary, with the addition of clam juice along with tomato juice, vodka, lime, and spices, served in a glass rimmed with celery salt. The cocktail’s creation is attributed to Walter Chell, manager of the Calgary Inn (now the Westin) in the province of Alberta. In 1969, the Inn was opening a new Italian restaurant and needed a signature cocktail. Chell based his recipe on the flavors of the Italian dish, spaghetti alle vongole, which is a pasta dish made with clams and tomato sauce. 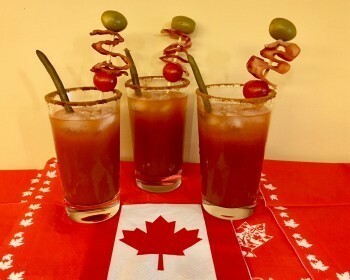 Through the years the Caesar has gained popularity in Canada and has become the national cocktail of Canada, with an estimated 350 million Caesars made annually. Keeping in mind that the population of Canada is only about 36 million, that’s a lot of Caesars consumed. Canadians have access to a pre-made product, Walter’s Caesar Mix, but Mott’s Clamato juice is easier to find in the U.S. Spread celery salt onto a plate. Rub a lime wedge around the rim of a highball glass, and then dip the glass into the celery salt. Fill the glass with one-third ice. Place the rest of ingredients into the glass and stir well. Recipe makes one serving. Have fun with the garnish – celery rib, pickled green beans, olives, bacon, pickles, pearl onions, herbs, etc.